So, it was short and sweet - although probably not so, for Glamorgan supporters. It's a pity the group stage had to end with so many games ruined by bad weather, but eight excellent teams have made it through, four of them past winners - Kent (2007), Sussex (2009), Hampshire (2010 and 2012) and Birmingham Bears (2014). There is plenty of life left in this season's T20 Blast and we will be back with you for the first quarter-final on 12 August. Glamorgan wicketkeeper Mark Wallace: "It's been a bit of a rollercoaster for us in the T20 this season and to go out on the last hurdle is the equivalent of a penalty shoot-out. But it would've been a lot worse to go out without playing. "Five overs a side is such a difficult game to play. This game in itself is not the reason we've gone out of the competition, it's the 14 games as whole." Gloucestershire wicketkeeper Geraint Jones speaking to reporter Rick O'Shea: "James Fuller bowled a fantastic over, but Graham Wagg was trying to hit him out of Cardiff, which it wasn't quite the wicket for. "It gave us a chance to assess the surface and work out how to play it. It's massively hit or miss this five overs. It looked a good wicket where it zipped on a bit, but it probably picked up a bit of pace off the surface and for people trying to swing off their feet, it didn't quite work." BBC Radio Bristol Commentator Ian Randall: "Beautiful shots from Chris Dent to finish it with two sixes. Gloucestershire win with more than an over to spare and it's a hammering. What an extraordinary evening here after we thought there was no chance of any cricket at all." Chris Dent finished things off in style by hitting a second successive six off Michael Hogan to see Gloucestershire home with seven balls to spare. The opener finishes on 28 not out from 11 balls faced, with partner Benny Howell on 11. Australian fast bowler Michael Hogan is one of the most consistent performers on the county circuit and Glamorgan need something truly special from him now. Dent and Howell pick up a single each from the first two deliveries, but Dent then drives through the covers for four and follows that with a huge six to bring the scores level. Essex fans can breathe a collective sigh of relief. BBC Radio Bristol Commentator Ian Randall: "Benny Howell went long and straight and it cleared the ropes - before being well caught in the crowd there by a man in a huge rain jacket." It is raining heavily as 37-year-old Dean Cosker takes the ball. He made his Glamorgan debut in 1996 and now has to stifle the Gloucestershire scoring rate to revive their chances of victory. The slow left-armer is wasting no time between deliveries, but Howell hoists the fifth into the crowd where a spectator takes a good catch. BBC Radio Bristol Commentator Ian Randall: "Gloucestershire halfway there after two of the three overs, but spin could play a part here as well as a shortage of recognised batsmen in the Gloucestershire line-up." Benny Howell contents himself with the final ball of the over, so Gloucestershire are half-way there with three overs left. A massive wicket for David Lloyd as Michael Klinger hammers the ball at Jacques Rudolph, stationed at mid-on, and departs for a single. Who's next? Ashes 2005 hero Geraint Jones. Glamorgan all-rounder Gareth Rees: "Glamorgan have got to get this game down to the last over, even if it means Gloucestershire only need six or five runs to win. It'll create pressure then and becomes anyone's game." Chris Dent takes a single to third man from Craig Meschede's opening ball, bringing Michael Klinger - the leading run-scorer in T20 Blast this season - onto strike. The Australian has hit 21 sixes, but is under way with one before Dent takes two with the ramp shot. The next two deliveries are dot balls, but Dent has the final word by smashing a six to take Gloucestershire into double figures. Graham Wagg will not take the field for Glamorgan after being struck on the helmet by Craig Miles, so Andrew Salter will be pressed into service in the field as 12th man. Michael Hogan, Craig Meschede, Dean Cosker and David Lloyd are likely to be four of Glamorgan's bowlers, but who will be the fifth? It's a tough call for captain Jacques Rudolph. Glamorgan all-rounder Gareth Rees: "Glamorgan are massively under the pump here, but that's not to say they can't go out here and win this game. If Michael Hogan opens up the bowling and finds the right lengths, who knows?" Glamorgan off-spinner and 12th man for the night Andrew Salter:" I think Graham will be OK, there's no big cut or marks there. He walked off the field OK. It's always a hard one to call when you're facing five overs. You'd back Graham Wagg to hit big sixes all day." So it's up to the Glamorgan bowlers now if they are to make it through to the quarter-finals. Graham Wagg would have probably been expected to bowl one of the five, but will he be able to do so after that blow on the head? The Welsh county have two spinners in their XI - will taking pace off the ball be the right tactic in this situation? Former Glamorgan batsman Tony Cottey: "If Glamorgan were 41-6 swinging from the hips, losing wickets, you could understand the low score. But with just one wicket down, people are going to be a bit bemused looking at it on the surface. I'd say they're 10 to 15 runs short there." Cooke smashes his first delivery over cover for four, but can't connect with the next, and things are looking good for Essex, whose own game against Kent had to be abandoned because of rain. The penultimate delivery brings two to long-on and Cooke can do no better from the last, leaving Gloucestershire to score 46 for victory and dash Glamorgan's hopes of a place in the last eight. Glamorgan all-rounder Gareth Rees: "It's been a disastrous decision to change the batting order. You're going to have Chris Cooke, Mark Wallace and Jacques Rudolph hardly facing a ball between them. Very disappointing. I feel sorry for Graham Wagg in this position as he's hardly ever faced the new ball in a one-day game." Craig Miles is one of the most promising young pace bowlers in county cricket and after beating Graham Wagg with his opening delivery, cracks him on the helmet with his second. Medical staff are immediately out in the middle to check on his condition. Wagg is able to walk back to the pavilion as Chris Cooke comes out to replace him, with four balls left in the innings. Graham Wagg connects with thin air as he attempts to smash Benny Howell's opening delivery into the stands. Last month the all-rounder hit 11 sixes in making 200 off 216 in a Championship game against Surrey, but his eye is well and truly out in this game as he adds just a single from the next four balls. Only one from the over as Meschede flails and misses at the last one. Glamorgan badly need a good final over. Commentator Edward Bevan: "Graham Wagg has missed out on eight or nine balls here, which is concerning. It's getting a little bit disastrous here." Although all eyes are firmly fixed upon events in Cardiff, we did actually get a full game in at Headingley tonight - and Yorkshire have just beaten Birmingham Bears by eight wickets. With the Bears already through to the next round and the Tykes without any hope of reaching the last eight, the hosts turned the form book upside down to successfully chase 146 for victory. Batsmen Alex Lees (63) and Jack Leaning (60 not out) did the notable damage. Graham Wagg finally gets bat solidly on ball as he mows Noema-Barnett away to the leg-side boundary before taking a single to deep extra cover, bringing new batsman Craig Meschede onto strike. An outside edge brings Meschede four runs, but he can only muster two from the final delivery as he mis-times the ball down to long-on. Glamorgan all-rounder Gareth Rees: "Craig Meschede coming out at number three, but I'm very surprised with this batting order and holding back Chris Cooke who has the ability to clear the ropes regularly. Mark Wallace has also got experience of opening in T20 cricket." James Fuller takes over bowling duties for Gloucestershire and immediately concedes four leg-byes, but beats Graham Wagg with his next four deliveries, dot balls Glamorgan can ill afford in a five-overs game. Wagg manages to get the bat to the final one but it goes nowhere and Fuller takes his team-mates' plaudits for a maiden. BBC Radio Wales presenter Rick O'Shea: "Credit to the boys and everyone involved here at the ground to get us in a position to get the game on. "There's a significant number of people who've come to the ground here tonight. "But, the rain does feel heavier than it did earlier in the evening when I last went out on the outfield." 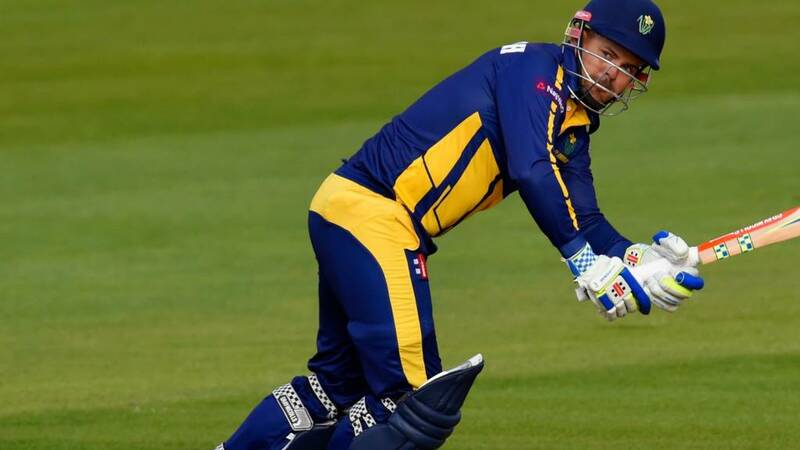 Glamorgan all-rounder Gareth Rees: "There's probably less than 1,000 people in here, but they're making a great noise and now there's a great chance to qualify for the quarter-finals." So what's a decent score in a five overs game? David Payne beats Colin Ingram with his opening delivery in the first of two powerplay overs, but the South African responds by hoisting the next one for six before drilling a four through the covers. A mis-field on the square-leg boundary gives Ingram another boundary and Payne then commits the cardinal sin of giving the Welsh county an extra delivery by sending down a wide. Glamorgan chief executive Hugh Morris on BBC Radio Wales: "Over a season of 14 games we've played really well in patches and not so well in others, but at least we've given ourselves a chance of getting through and now we've got to try and take it." Glamorgan: Rudolph (capt), Wallace, Ingram, Cooke, Wright, Donald, Meschede, Wagg, Lloyd, Cosker, Hogan. Gloucestershire: Dent, Klinger (capt), Jones, Noema-Barnett, Howell, Hammond, Payne, Taylor, Smith, Miles, Fuller. It would be tough on Essex if they lose their place in the last eight after waiting as long as possible before having to call off their own game against Kent at Chelmsford. But don't expect Welsh cricket fans to shed any tears if their team succeeds in reaching the knockout phase of the competition for the first time since 2008. So here we are then....after the abandonment of six of the final round games because of rain, and events at Headingley between Yorkshire and Birmingham Bears having no bearing on the T20 Blast quarter-finals, we have a little late evening excitement for you. Thanks to the efforts of the groundstaff at Cardiff's Swalec Stadium, we are going to have a five overs-a-side game between Glamorgan and Gloucestershire. The equation is simple - if Glamorgan win, they go through as one of the four qualifiers from South Group. If they don't, Essex will claim the final place.